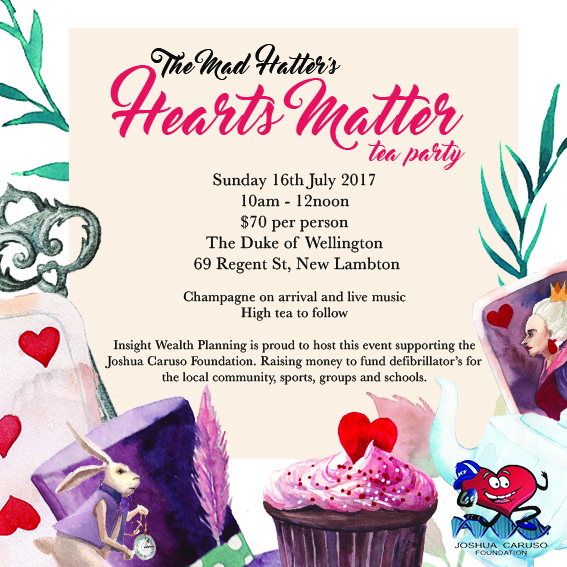 This year, we are proud to host the upcoming Mad Hatters Hearts Matter Tea Party on Sunday 16th July 2017 10am-12pm. This year we are delighted to have chosen The Joshua Caruso Foundation to partner with to direct all funds raised to their goal of supplying defibrillator’s to local community groups, sports groups and schools in an effort to prevent a cardiac event from becoming more serious when a sudden event occurs. The Mad Hatters Hearts Matter Tea Party is proudly supported by Insight Wealth Planning, Property 101 Solutions, WSC Group Newcastle, Reno Riches, Viatek, Australian Property Finance New Lambton, Impero Conveyancing, and The Duke Hotel New Lambton. Helping The Joshua Caruso Foundation to supply defribrillators to sporting clubs and schools in the Newcastle and Hunter region.